Jon Bialecki: The center of your ethnography is about the Prosperity Gospel’s economy of faith and social ambition in the Copperbelt. The prosperity gospel and the Copperbelt have certain reputations, both in anthropology and the wider popular culture; and I think that one of the surprising things about your book is how you challenge the commonly held stereotypes about both of these social forms. What was it about the state of the literatures that made you feel that interventions were necessary? Naomi Haynes: When I set out to do my fieldwork on the Copperbelt, anthropology had a pretty clear view of both this region and of the prosperity gospel churches that had become very popular there. In terms of the latter, both the prosperity gospel and Pentecostalism more generally had largely been interpreted in terms of what Joel Robbins calls “compensatory promises”: people converted to Pentecostalism because it promised things that they were (increasingly) unable to access elsewhere as the welfare state retreated and the global economy changed. In this narrative, the Copperbelt seemed like an especially compelling case in point. The influence of James Ferguson’s Expectations of Modernity meant this region had been fixed in the minds of many anthropologists as the paradigmatic site of neoliberal abjection, a once-thriving extraction economy that had been swiftly cut off from the promises of globalization – in other words, just the kind of place where people might be hoping for an economic miracle in the form of divine prosperity. While it was not difficult to see why people would find the promises of Pentecostalism so compelling, I didn’t feel that the hope of riches or health by itself explained this religion’s staying power; it’s one thing to sign up to a program that promises wealth, but it’s another to continue to give it time, energy, and money without getting much in return. I was therefore sure there was more to the prosperity gospel story than just the hope of getting rich, and my fieldwork revealed this to be the case. It turned out that Pentecostalism wasn’t so much about getting access to wealth that was otherwise unavailable, but rather about creating other modes of realizing value through personal spiritual advancement. So, Pentecostalism wasn’t a second-best option, but a point at which people were working to produce a good life for themselves. Similarly, life on the Copperbelt wasn’t all abjection and despair, but action, innovation, and creativity. Jon Bialecki: Your book in large part focuses on ‘moving’ as a Zambian concept; ‘moving’ in fact is so important that it gives your book its title. I was wondering if you could say a little bit about what ‘moving’ is, and also about how it relates to the way that the Prosperity Gospel works in the Copperbelt? Naomi Haynes: Moving (ukusela in Bemba) is a term that people on the Copperbelt use all the time to describe the way that their lives and those of others are changing positively. They say things have moved when a child completes school, when someone gets married, or when a family moves into a bigger house or purchases a used Toyota. But moving isn’t just an idiomatic way of talking about progress. On the Copperbelt, moving is a value, by which I mean it is an animating idea that structures social life. Most social relationships on the Copperbelt, including those that form in Pentecostal churches, are organized to make moving happen. Looking at moving therefore helps us understand how social life on the Copperbelt works, and perhaps especially the social life of Pentecostal churches, which have become key sites for a new religious form of moving “by the Spirit.” Pentecostal believers move by the Spirit both by realizing traditional forms of moving (houses and husbands), as well as uniquely Pentecostal forms of moving such as spiritual development or advancement in the church hierarchy. 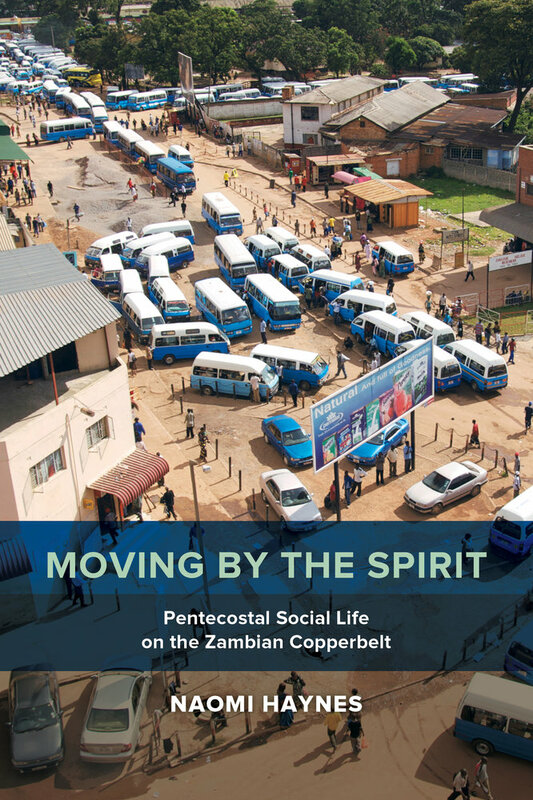 Jon Bialecki: One of the things that struck me in reading your book is the relation between this long-running Copperbelt value of moving, and the relatively recently introduced form of prosperity-gospel Christianity. As you know, there’s been a lot of back and forth in the anthropology of Christianity about ‘rupture’ and ‘continuity,’ with scholars like Joel Robbins and Birgit Meyer emphasizing how the adoption of Pentecostal Christianity often results in a historical sense of conversion as a radical transformation, while other scholars (such as Matthew Engelke, Liana Chua, and Mark Mosko) seeing much more social continuity, both marked and unmarked, in recently Christianized societies. I was wondering if we could read the importance of ‘moving’ here as telling us something about this debate? I suspect that this is a case that can’t be boiled down to a simple ‘nothing changes’/‘everything changes’ dichotomy. Naomi Haynes: I get asked about rupture all the time – it’s easily the concept that people working outside of the anthropology of Christianity associate most with the anthropology of Christianity. And there’s no question that rupture has done important analytical work, not only for the subfield, but also for the discipline as a whole. The model of conversion as rupture has given us a new way to talk about cultural change more generally, and the most sophisticated work on rupture has always kept this larger question in view. However, as time has gone on I think that the emphasis on rupture has sometimes given way to something more mathematical than analytical; the question has moved from how change happens to a simple accounting of what has and has not changed – whether there are more elements in the “change” or “continuity” column, in other words. Against this latter interpretation, what I hope my work on moving demonstrates is that Christian adherence affords all kinds of creative cultural responses that structure and are structured by external forces like economics or politics. Rather than describe Christianity in terms of rupture or continuity, then, I have found it more productive to think of Christianity as a means of “making life possible,” to borrow a turn of phrase from Achille Mbembe. In the Copperbelt case, this means finding new ways of realizing an existing value, but in other contexts making life possible will necessarily take other forms. The question isn’t so much whether or to what extent this represents a rupture as much as what Christian adherence does in the places where it is taken up. Jon Bialecki: Let me follow up on your of idea of shifting from some kind of binary up-or-down judgement of ‘order/rupture,’ to instead thinking about what novel local potentialities Pentecostalism as an imported form opens up. I want to do this by asking some questions about media and performance (this is, after all, CaMP). One of the things that really caught my attention when reading your book was the aesthetics of Copperbelt Pentecostalism, and how it seemed to be at once very ordered and extremely chaotic. On one hand, especially during celebrations involving gift exchange, there seemed to be a strong emphasis on decorum and consistency, down to asking women to wearing matching dresses (a request that was even directed to the anthropologist!). On the other hand, there also seemed to be an importance in indecipherability and chaos; in this case I’m referencing the uncanny sonic anarchy that occurs during what you called ‘collective-personal prayer.’ In what ways is this in continuity with the aesthetics or communicative ideology of the Copperbelt, and in what ways is this a new situation in which Pentecostalism has allowed for some mutation, reimagination, or replacement of Copperbelt sensibilities? Naomi Haynes: I’ve always been struck by the uniformity of the Copperbelt aesthetic as well, which I think connects to the aspirational quality of display in urban Zambia. Every Copperbelt sitting room that I’ve ever entered, whether in a mud brick house in a shanty compound or the spacious home of a banker, is decorated according to a common template. There’s a suite of matching sofas (however broken down), a television (which may not work), and a cabinet or set of shelves for curios. The differences among homes are therefore differences of degree rather than kind, and this makes domestic display a key site at which moving is realized. By comparing like with like, everyone knows where they stand relative to everyone else, and everyone can measure how well they are moving. Pentecostalism produces similar types of metrics, and indeed, one way that moving by the Spirit can be measured is in the same sorts of consumer displays that structure moving more generally. But other religious metrics of moving are similarly organized by rank-able displays. Those who are moving by the Spirit excel in prayer, prophecy, preaching, and singing, all gifts that presuppose an audience. This is true even when the specificity of one’s gift is drowned out by the cacophony of collective-personal prayer that you mention. Skill in this type of prayer depends much more on facility with the form rather than on its content, and insofar as this is the case, it is a performance for others at least as much as it is a semi-private dialogue with God. Charismatic displays like this are perhaps an especially good example of how Pentecostal characteristics like spontaneity and surprise, which have been so important in your own work, get mobilized in service of larger social projects in the Copperbelt context. In other words, the loud, effervescent and even ecstatic prayer that always characterizes Pentecostal worship actually facilitates something that’s extremely uniform, and therefore easily measured. Jon Bialecki: Finally, one last performance and media question! As we have discussed all through this interview, at the local level the prosperity gospel is a chance for people to solve old problems in new ways, which explains at once how in your field site it was very much Zambian, while still recognizably an iteration of global forms. We’ve also stressed how this allows for various forms of local production of social ties. But at the same time, the sort of Pan-African or internationalized large scale Prosperity Gospel events are also present in the Copperbelt – or at least present in the mediated form of video. And it seems at times that some of your informants have strong opinions about the latter instances of the prosperity gospel. I was wondering if you could give us a sense of how your informants evaluated and consumed (or perhaps didn’t consume!) these other video instantiations of the prosperity gospel, and how important the differences in mediation and performance were in their assessment. Naomi Haynes: The Pentecostal media landscape, especially television, has grown increasingly complex in the fifteen years that I have worked in Zambia. At last count, there were a dozen free-to-air Pentecostal television stations available on the Copperbelt. In addition to sermons and gospel music, these channels also broadcast miracles – lots of exorcisms, as well as healings and other wondrous signs, including a famous example of a pastor who appeared to walk on air. Of course, not all these displays are accepted as genuine, and there is a great deal of debate as to which global pastors are true servants of God and which are actually in league with Satan. But what I think is especially interesting about Pentecostal media consumption on the Copperbelt is the way that those pastors and prophets who are regarded as authentic get worked into familiar local practices. One thing we haven’t touched on so much in our discussion is the extent to which moving is about patronage. Mega-pastors in places like Nigeria or South Africa, who people on the Copperbelt encounter only through television, are often appealed to as potential super-patrons. For example, several years ago there was a rumor that Prophet T.B. Joshua of Nigeria would be appearing at a stadium in Lusaka. Many hundreds of people turned up on the day to find the reports were untrue, and they were understandably angry. The national news that evening featured a woman who was interviewed on the scene calling on the president to bring T.B. Joshua to Zambia; people needed him to come and bring healing and “deliverance” (the Pentecostal term for exorcism). What struck me in this interview, apart from the request for state intervention in the matter (another interesting aspect!) was how this woman envisioned T.B. Joshua’s presence in Zambia, were he to come. She was asking him to do the same things that all pastors do, and in this way, she was inviting him to be part of a very local provision of religious services, a provision that facilitates moving by the Spirit for my informants. So, while believers on the Copperbelt are connected to transnational religious networks, and recognize that they are part of a global religious movement, their engagement with that is always slotted into very local concerns.